March Madness starts next week, and the days of cursing your job silently all day because you’re missing all the action… they’re over. 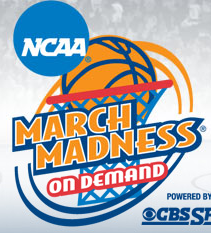 You can watch every single game, online… for free… over at CBS Sports. You do have to register, but still. Free, people! It seems like just yesterday that they were beginning to experiment with this sort of thing. You mean to say, if we deliver a television experience over the web at a time most people don’t have access to television, people will watch? And we can make money off it? I used it the first year and I have to say…it’s quite awesome.